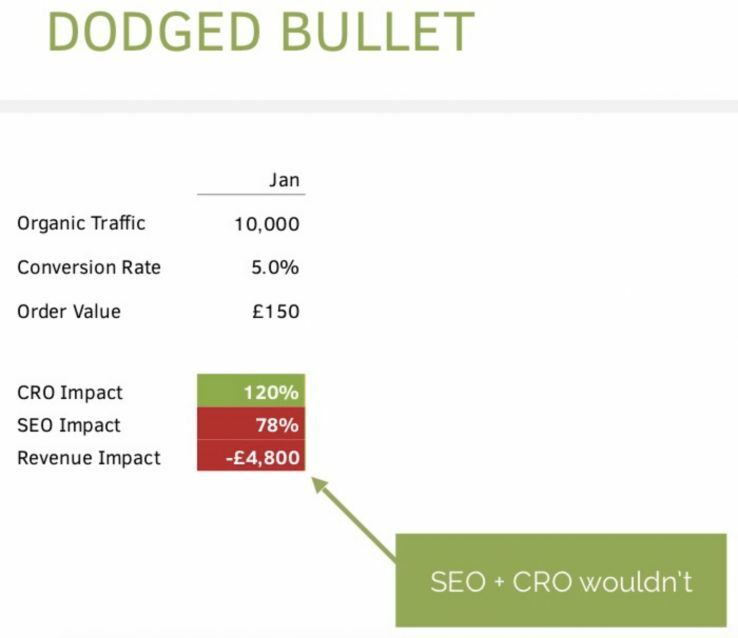 What Happens When SEO and CRO Conflict? 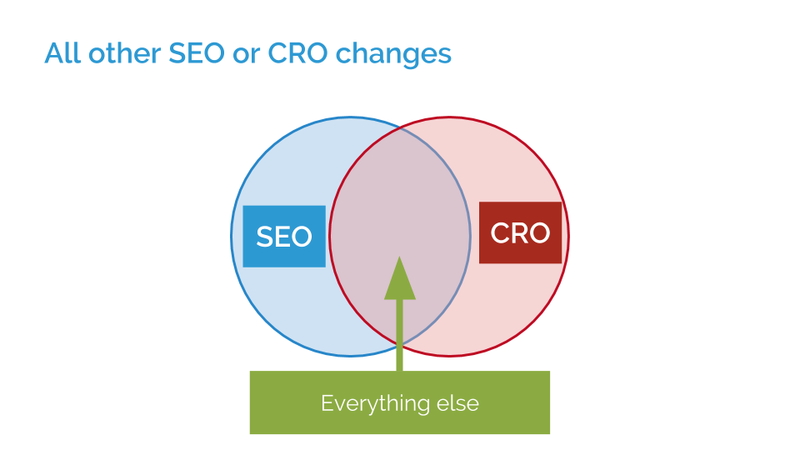 Much has been written and spoken about the interplay of SEO and CRO, and there are a lot of reasons why, in theory, both ought to be working towards a shared goal. 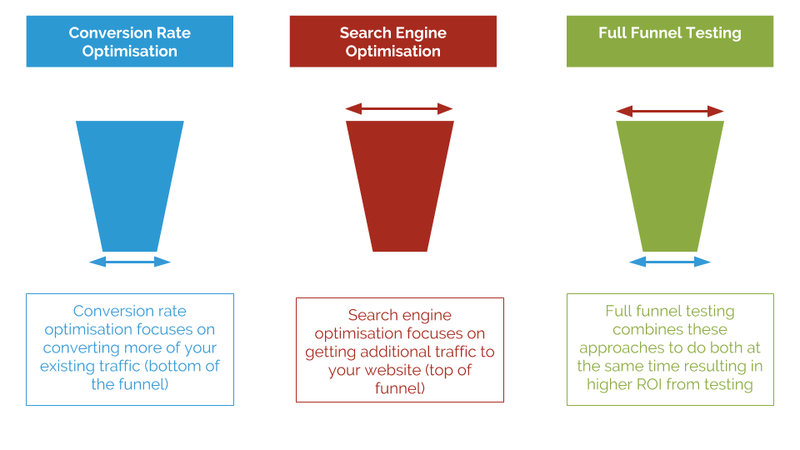 Whether it’s simple pragmatism of the business benefit of increasing total number of conversions, or higher-minded pursuits such as the ideal of Google seeking to reward the best user experiences, we have many things that should bring us together. In practice, though, it’s rarely that simple or that unified. How much effort do the practitioners of each put in to ensure that they are working towards the true shared common goal of the greatest number of conversions? 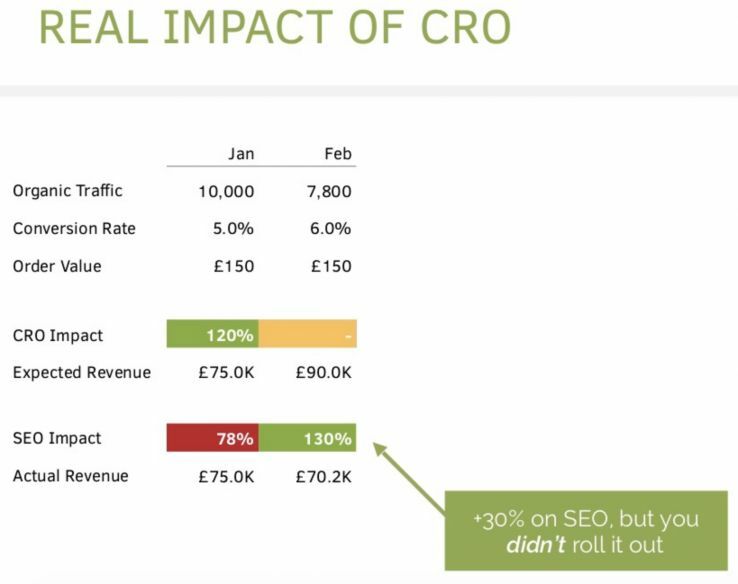 In asking around, I’ve found that many SEOs do worry about their changes hurting conversion rates, but few actively mitigate that risk. 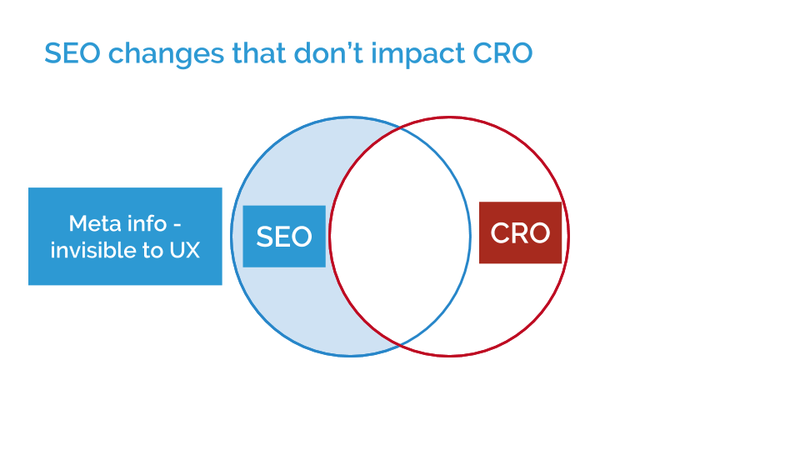 Interestingly, my conversations with CRO experts show that they also often worry about SEOs’ work impacting negatively on conversion rates. 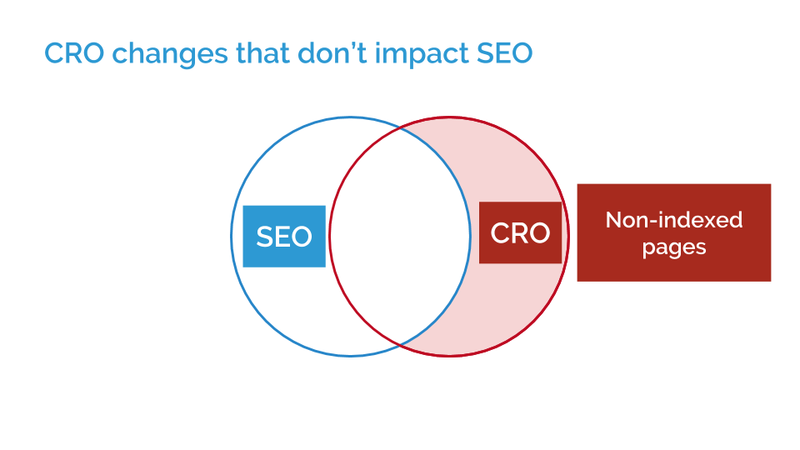 Neither side weights as highly the risks that conversion-oriented changes could hurt organic search performance, but our experiences show that both are real risks. So how should we mitigate these risks? How should we work together? 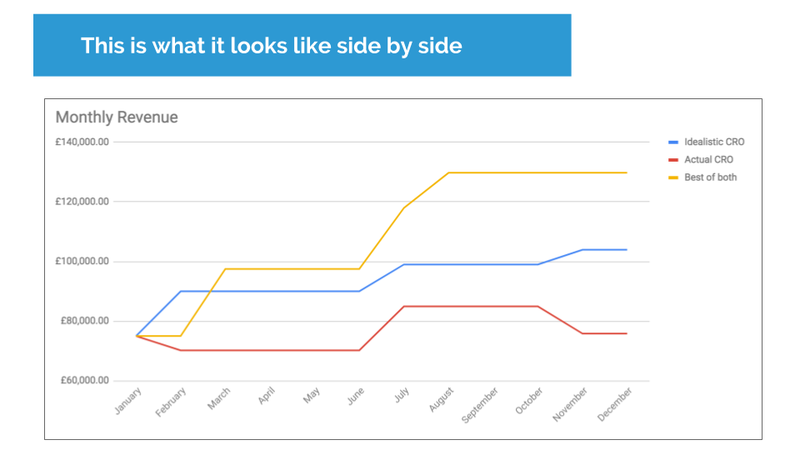 So throughout this post, I’ve talked about our experiences, and work we have done that has shown various impacts in different directions, from conversion rate-centric changes that change search performance and vice versa. How are we seeing all this? 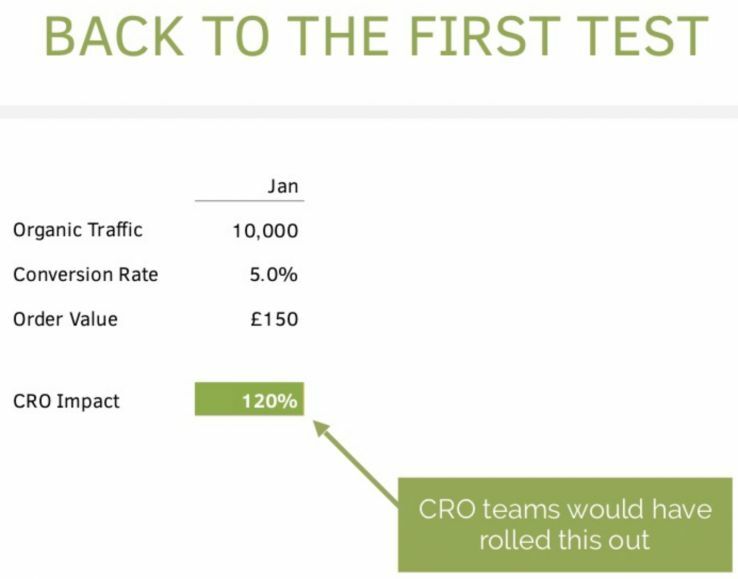 If you’re interested in the technical details of how we do the testing, you can read more about the setup of a full funnel test here. (Thanks to my colleagues Craig Bradford and Tom Anthony for concepts and diagrams that appear throughout this post). 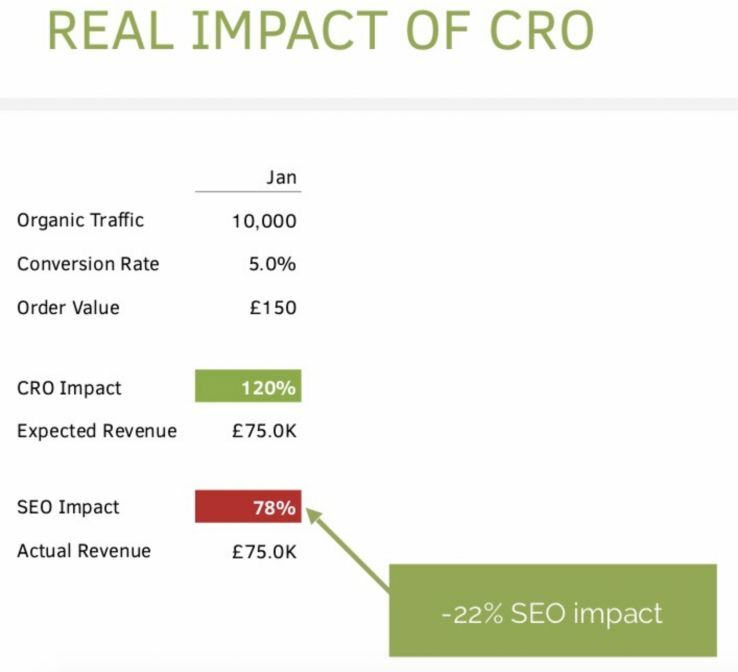 But what I really want to talk about today is the mixed objectives of CRO and SEO, and what happens if you fail to look closely at the impact of both together. First: some pure CRO. 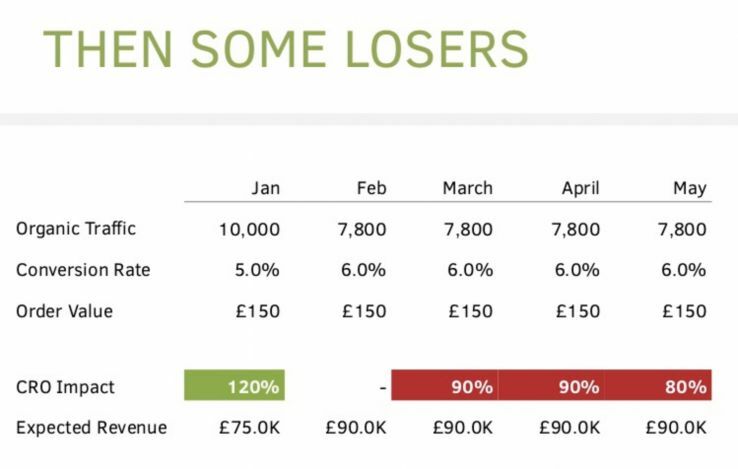 In the example that follows, we look at the impact on an example business of a series of conversion rate tests conducted throughout a year, and see the revenue uplift we might expect as a result of rolling out winning tests, and turning off null and negative ones. 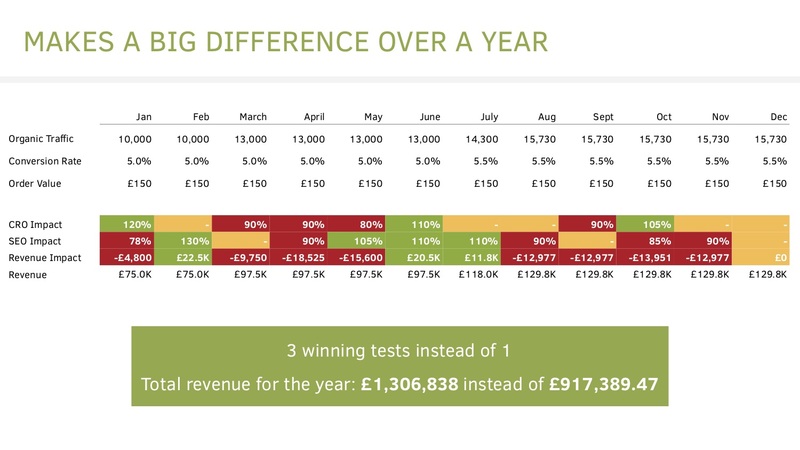 We compare the revenue we might achieve with the revenue we would have expected without testing. The example is a little simplified but it serves to prove our point. Is this the full picture, though? Most of the time, we want to see if making a change will improve performance. 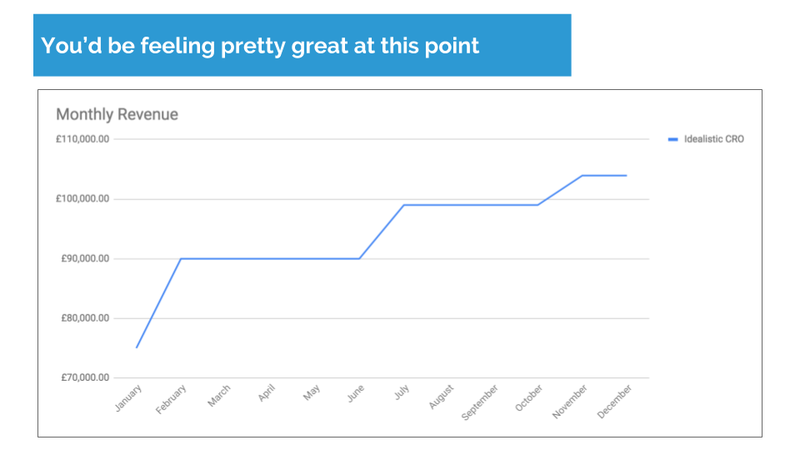 If we change our product page layout, will the order conversion rate increase? If we show more relevant product recommendations, will the Average Order Value go up? But it’s also possible that we will run an AB test not to improve performance, but instead to minimize risk. 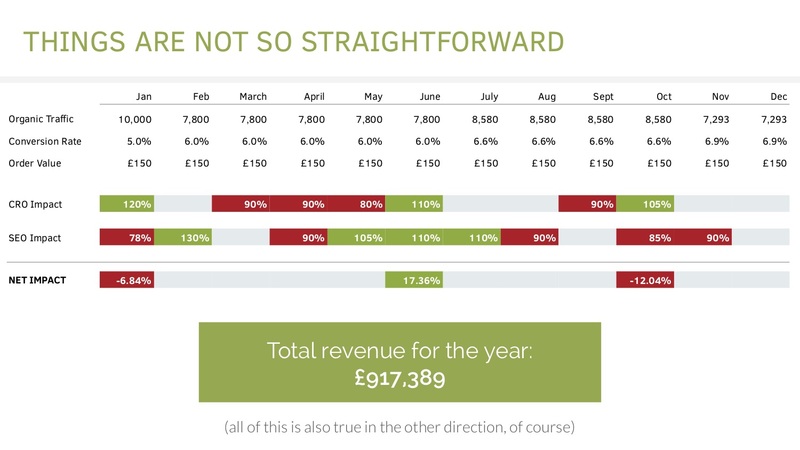 Before we launch our website redesign, will it lower the order conversion rate? Before we put our prices up, what will the impact be on sales? In either case, there may be a desire to deploy the new variation — even if the AB test wasn’t significant. If the business supports the website redesign, it can still be launched even without a significant impact on orders — it may have had significant financial and emotional investment from the business, be a better fit for the brand, or get better traction with partners (even if it doesn’t move the needle in on-site conversion rate). 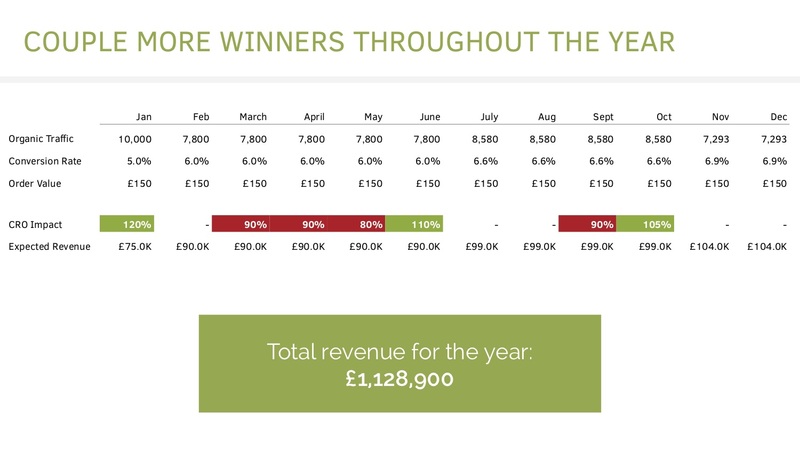 Likewise, if the price increase didn’t have a positive/negative effect on sales, it can still be launched. 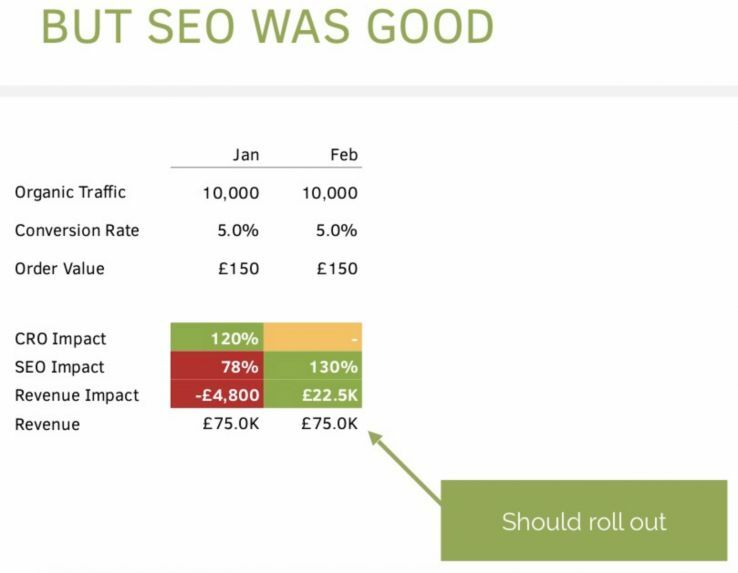 Most importantly, we wouldn’t just throw away a winning SEO test that reduced conversion rate or a winning conversion rate test that negatively impacted search performance. Both of these tests would have come from underlying hypotheses, and by reaching significance, would have taught us something. We would take that knowledge and take it back as input into the next test in order to try to capture the good part without the associated downside. All of those details, though, don’t change the underlying calculus that this is an important process, and one that I believe we are going to need to do more and more. The trend towards Google using more and more real and implied user satisfaction and task completion metrics means that conversion-centric tests and hypotheses are going to have an increasing impact on search performance (if you haven’t yet read this fascinating CNBC article that goes behind the scenes on the search quality process at Google, I highly recommend it). Hopefully there will be an additional opportunity in the fact that theoretically the winning tests will sync up more and more — what’s good for users will actually be what’s good for search — but the methodology I’ve outlined above is the only way I can come up with to tell for sure. I love talking about all of this, so if you have any questions, feel free to drop into the comments.